An artist rendering of NASA's gamma-ray burst hunting Swift observatory in space. The Neil Gehrels Swift Observatory (previously called the Swift Gamma-Ray Burst Explorer) is a long-running space telescope that searches for gamma-ray bursts, which are huge explosions in the universe that happen about once a day. Researchers use Swift and other facilities to probe these bursts, to learn more about their origins. Swift launched on Nov. 20, 2004, on a Delta II rocket from Cape Canaveral Air Force Station near Orlando, Fla. Originally planned for a two-year mission, it remains in good health as of mid-2018. In January 2018, NASA renamed Swift after its first principal investigator, Neil Gehrels, who died the previous year. Astronomers think gamma-ray bursts (GRBs) come from either supernova explosions of massive stars, or from the collision of two dense supernova remnants that are called neutron stars, according to a 2016 NASA Astrobiology Magazine article republished on Space.com. If these bursts occurred close enough to Earth, the radiation produced could peel away Earth's ozone layer and leave the planet exposed to other space hazards, such as the sun's ultraviolet radiation. But from a distance, GRBs are still interesting because they provide information about how stars evolve. The first GRB was found in 1967 on a U.S. Air Force satellite called Vela, which was part of a series of probes designed to look for nuclear blasts on Earth. But early gamma-ray probes, according to NASA's Goddard Space Flight Center, were poor at figuring out how far away GRBs occurred, making it difficult to figure out if they took place within our Milky Way, or much farther. 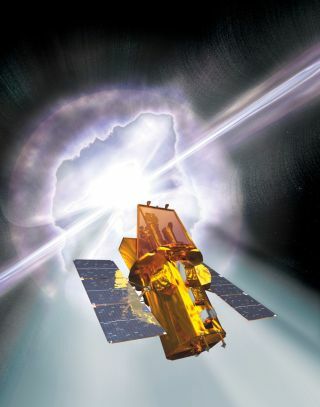 Past missions that could search for GRBs included NASA's Compton Gamma-Ray Observatory and an Italian X-ray satellite called BeppoSAX (which spotted X-ray "afterglows" after gamma-ray bursts). The X-ray observations made it easier to pinpoint the distance of GRBs, most of which appear to be hundreds of millions to billions of light-years away. But the science community said there was a need for an observatory that could automatically slew to the source of a GRB in the moments after it occurred. In 1999, Swift was selected as a semi-finalist from among 35 proposals for NASA's medium-class Explorer (MIDEX) program. After competing against five semi-finalists, Swift was selected for a launch no earlier than June 30, 2004. The mission cost was capped at $140 million in 1999 dollars, and Swift was projected to cost $135 million, according to NASA. Determine how the burst evolves and interacts with the surroundings. Swift piled up several interesting observations in its first few years of work, including detecting multiple eruptions from a black hole in quick succession, compiling data on what was said to be the most distant explosion ever in 2005, and finding what was said to be the closest neutron star in 2007.
supermassive black holes emit hard X-rays during the mergers of their parent galaxies. Previous to this finding, scientists weren't sure how the high-energy bursts occurred. Also that year, Swift spotted a burst of X-rays so powerful that it briefly blinded the telescope. GRB 100621A, as the event was called, was said to be the brightest light source ever seen in X-rays at cosmological distances. Fortunately, the telescope quickly recovered and its data showed that the burst emitted 143,000 X-ray photons per second when it hit maximum brightness. The brightest continuous X-ray source is 140 times fainter than that; it is a neutron star that sends out 10,000 X-ray photons a second. Swift hit a milestone in 2010 with its 500th gamma-ray burst observed. "On the one hand, it's just a number, but on the other it is a remarkable milestone," said Neil Gehrels, Swift's lead researcher at Goddard Space Flight Center in Greenbelt, Md., in an interview at the time. "Each burst has turned over a new piece of the puzzle and a clearer picture is emerging." An unusually long and bright explosion Swift studied, and which was released in 2011, had astronomers wondering if the source was a star being ripped apart, or something else. "We know of objects in our own galaxy that can produce repeated bursts, but they are thousands to millions of times less powerful than the bursts we are seeing now," said Andrew Fruchter, of the Space Telescope Science Institute in Baltimore, in a statement. "This is truly extraordinary." Meanwhile, another X-ray explosion recorded in 2012 was said to be evidence of a hidden black hole in our galaxy. Other team-ups also produced interesting results. Work with the Spitzer Space Telescope in 2016 revealed more information about a brown dwarf, a "failed star" object too small to ignite nuclear fusion; this type of object is hard to spot in the sky. In results released in 2011, Swift contributed to observations of an asteroid, 596 Scheila, which likely brightened in the wake of a collision. The telescope also helped with finding a pulsar embedded in a huge nearby galaxy, Andromeda, in a find announced in 2017. The telescope was briefly repurposed in 2017 to observe a comet, 41P/Tuttle-Giacobini-Kresák, that experienced "the largest but also the fastest change that has ever been seen in a comet rotation," said Dennis Bodewits, an associate research scientist at the University of Maryland (UMD) in College Park, in early 2018. Swift's contribution was observing cometary jets with its ultraviolet/optical telescope; there, it was able to see UV light emitted by hydroxyl molecules, formed when sunlight interacts with the gas.